I recently read Penelope Lively’s ‘Ammonites & Leaping Fish‘, a thoughtful memoir in which she explores the meaning of memory and links moments in her life to precious objects, not valuable artefacts necessarily, but meaningful and even sentimental. Ian Wedde, too in his recent memoir ‘The Grass Catcher’ evokes memory through objects and the odours of his youth. The main object being the grass catcher. (Some of the odours he mentions are best left to be read about.) Although, I guess there’s probably not a Kiwi kid from the 50’s and 60’s who doesn’t remember the smell of freshly cut grass, and a hand mower with a canvas catcher. Or indeed, who doesn’t recall the whiff of two-stroke petrol when the family upgraded from a hand to a motor mower… and in your over-enthusiasm pulling out the choke, the mower flooded. On reading these memoirs, I realised that my garden whenever I wander in it, evokes important milestones both happy and sad. It was over Labour Weekend, home alone with a broken wrist, somewhat sorry for myself, that I sat reading on our sunny deck and recalled it was my Aunt’s birthday. That’s my deceased Aunty who would have been 94 this year. What made me recall her, was not just the date, the 25th of October, her birthday but that she would often come to stay with us for Labour Weekend and we would share her birthday. And that the cherry blossom tree that we built the deck around would be in full flower. Since then, we’ve chopped down the cherry tree – as it was taking up so much room on the deck but the memory of the cherry blossoms and my Aunt are intermingled. This prompted me to explore my garden and I found another blossom tree that forms an almost canopy on the lower part of our hillside section. The first year we moved into this house, our youngest son was six (he’s now 33) and we have a photograph of him standing under the flowering canopy with a chipped front tooth – memorable, because that very next day he was going to be page boy at the wedding of friends, fully decked out in matching tail-coat with his father who was the Groomsman. I remember being annoyed he’d broken his tooth. The couple who married, now have a daughter off to university next year. Whenever I look out our bedroom window in Spring and see the blossoms, I see our son with his chipped tooth, and then I remember our friends’ wedding anniversary. Immediately beneath the blossom canopy is a very important memorial to our deceased cat Red who just happened to be a almost twenty year old black and white cat. 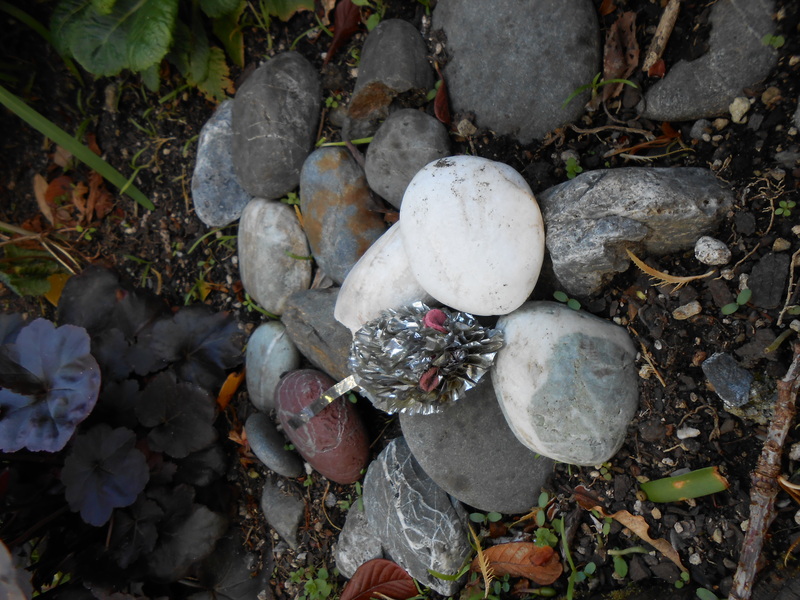 Our granddaughter who adored Red, has made a pile of stones and shells in the garden as a tribute, and this includes a once shiny tinfoil mouse. The cat’s ashes are inside our house in a box, or are they? That’s another story, told in a poem and here is the link. 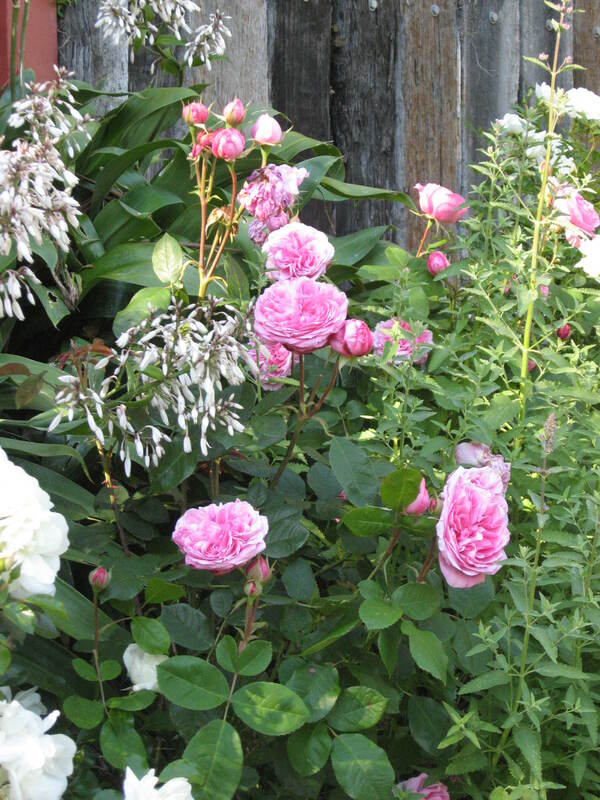 Then there are my roses. They bring me both joy and a stab of grief. Roses enjoy being hacked it seems. 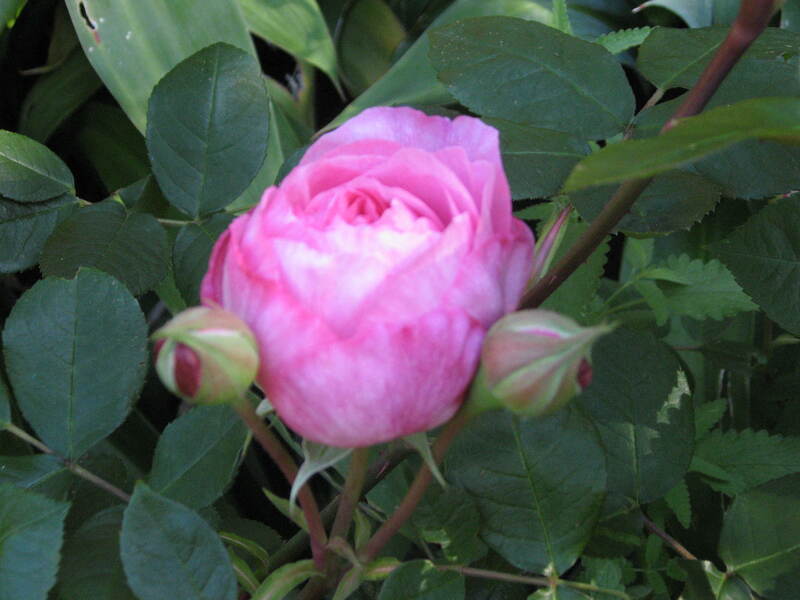 The possums last year were feasting on my roses, and so I cut them back savagely to pervert the possums – it seems the roses enjoyed this and they are looking positively radiantly ready to burst into many buds. This includes Kate Sheppard, named after the feisty Kiwi feminist whom we thank for the vote. My Korean daughter-in-law helped me plant Kate – a treasured gardening memory, all the more poignant as this year, she moves on to a new life, away from our family. No-one warned me that as a mother-in-law I could also have my heart broken. More violent and perhaps funnier, is the silk tree at our gate. One day, some years back now, after a fiery argument with my beloved, in fury and frustration, I attacked the silk tree – it was growing out over the path and obstructing the entrance. I chopped and chopped and snapped and attacked and I’m not sure what my neighbours thought. I felt bad afterwards and imagined the silk tree doomed, but it, like the roses, has thrived – but always to remind me of my tantrum. Then there are the daisies that were once very fashionable in cottage country gardens. 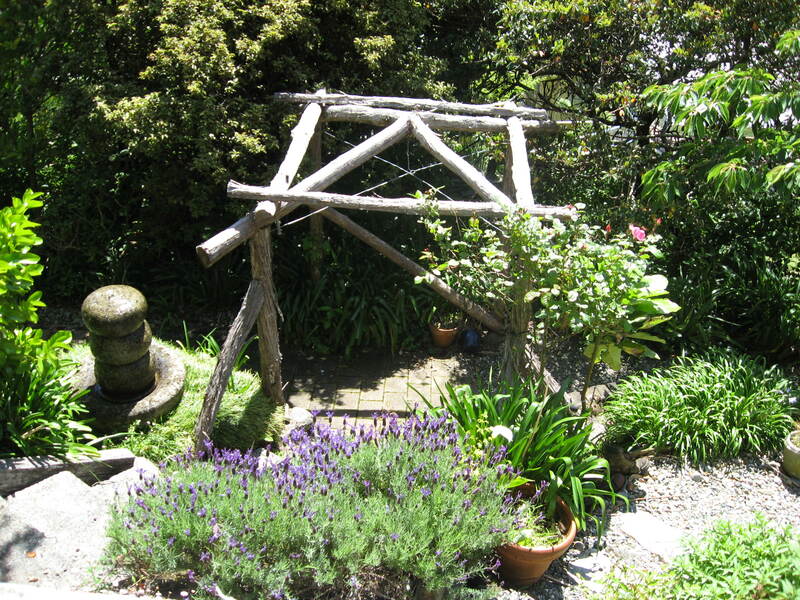 I tried slavishly to cultivate a cottage garden look to no avail. 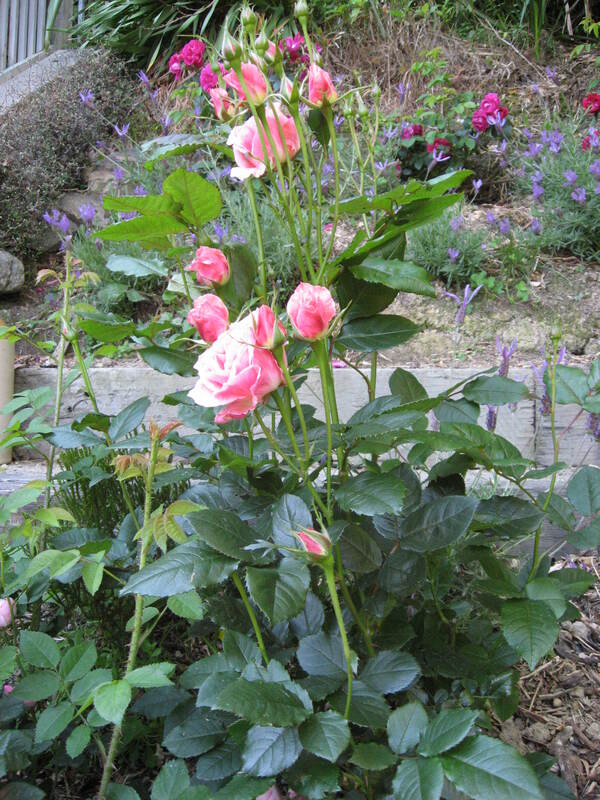 And then when we converted to a more coastal (but let’s keep the roses), suddenly the packet of seed that I sowed decided to grow. And now those daisies are considered weeds, but I allow them their rampancy as it only seems fair that they have tried so hard. They interweave with a beautiful old-fashioned red-leafed creeper with tiny mauve pom-pom flowers. The two fight for supremacy and I keep them both in check. Too, as you enter out front gate by the almost demolished silk tree, there is a softly delicious smelling jasmine plant that entwines with the wildly fragrant honey-suckle. Both plants are now considered ‘outlaws’ as we live next to a native reserve… but the scent is so delicious of an evening that I cannot bring myself to be rid of them entirely. Inside our front gate are two Daphne bushes bringing their ‘lawful’ luxurious bouquet to our doorstep. Dare I mention my rogue (practically heretical) ginger plants. They look so striking and I’ve tried to strike them out. Alas, they resurge. Recently I posted a poem inspired by the tuis in our Kohwai tree. This tree was but a wind-blown seedling on the side of a clay bank that I was about to tear out while weeding when we first moved in. Something stopped me. It seemed wrong to not want a Kowhai, even though it was in the wrong place. 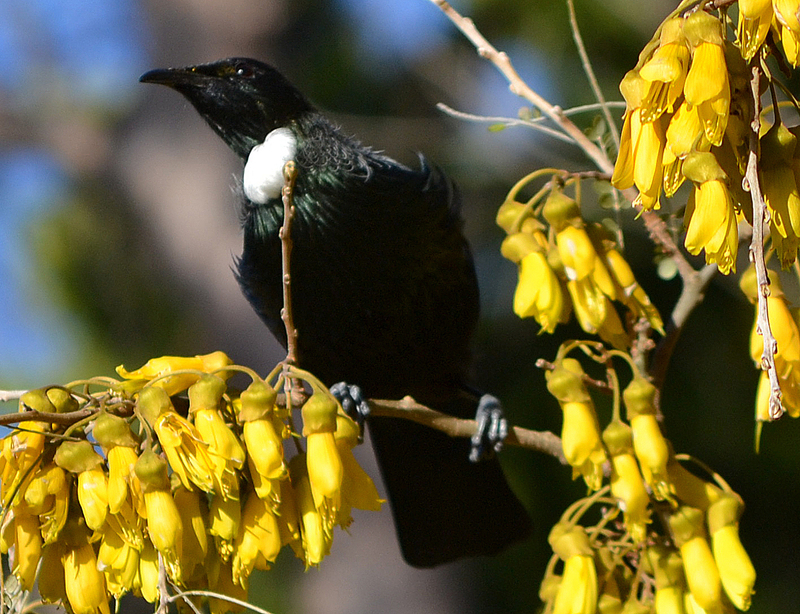 The Kowhai now is a superstar where in springtime eight or nine tuis can be found feasting. It shades my washing line, something I lament, but the song of the tuis and the sight of the overweight kereru, more than compensates. So, my garden is full of birdsong, flowers and my heart’s song, a testimony to loss and new growth.